German tuner Gemballa has unveiled its latest Avalanche conversion programme for the 991 Porsche 911 Turbo at the ongoing Geneva Motor Show, which continues the tradition of coaxing as much performance out of the two-door sports car as possible. The first order of business involves the Porsche’s 3.8 litre twin-turbo six-cylinder engine, where Gemballa’s engineers have done the following modifications: reprogrammed engine and gearbox electrical system, higher-performance turbochargers, new intake manifolds and air suction housing made of carbon, new throttle valve bodies, a high-performance air filter, and reworked cylinder heads and valves. If that isn’t enough, the car also gets a sport exhaust system with four, large end pipes that deliver the “right sound,” according to the company. The end result is an output of 820 hp and 950 Nm of torque, which is a whopping 240 hp and 200 Nm more than what you’ll get from the already-fast 911 Turbo S. Or to put it simply, you have an avalanche of power at your disposal. Curiously, Gemballa didn’t reveal any performance figures of the Avalanche, but it should deliver a marginally faster 0-100 km/h time than a regular 911, and possibly a higher top speed. As a benchmark, the 911 Turbo S does the century sprint in 2.9 seconds with the Sport Chrono pack, and is capable of hitting 330 km/h. To ensure the rest of the car isn’t burdened by the new-found power, Gemballa installed an adjustable sport chassis as well as 21-inch forged wheels wrapped with 255/30 front and 325/25 rear tyres. A more aggressive and wider body, which sees a 62 mm increase in front track width and 100 mm at the rear, is also added to allow room for the larger tyres. Other components on the car’s exterior are made from carbon-fibre to keep the things lightweight, and some even provide aerodynamic benefits. We reckon that enormous rear wing is a necessity to keep the car grounded at high speeds. Gemballa says an “Avalanche would not be an Avalanche without an opulently refined interior,” so two-tone black and white leather upholstery is applied generously around the cabin, together with Alcantara and carbon-fibre accents. OMG. As if the 911 turbo S is not good enough for this iconic car. Now U have Gemballa to add more performance to this 911. 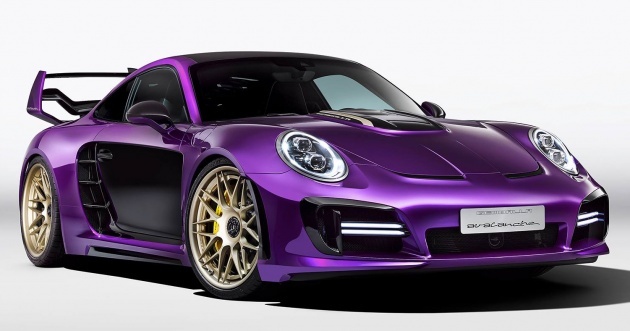 Clearly this Purple colored 911 is Not for our M’sian purchaser as it stand out from the rest with the special color. Anyone would like to guess the asking price ?? PS. This is not for sale Yet or Gemballa is just teasing the public perception to see their reaction !? Either way, this 911 looks & color have taken my breath away.